I told him that is a good thing because it means my brain is working. And really, I need my brain to work as much as possible. I have written before about the the importance of reading. I also do book reviews. 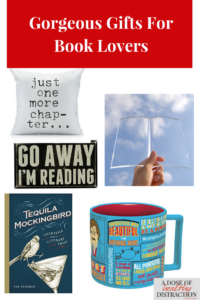 So I came up with a list of gifts for bookworms like myself. The great thing about my gift lists is that you don’t have to leave your house. I’m all about shopping online. Yes, this post contains affiliate links. See my full disclosure policy. Literary cocktails – because who doesn’t like to combine a cocktail with a good book? Book light for reading in bed. Don’t want to disturb the Hubs’s beauty sleep. Mugs. For the times when you want a hot beverage with some legal addictive stimulant (caffeine). Go away sign. I need one of these for my office, my bedroom, my living room, and probably my car. This pillow. Because it is perfect for those of us that lose sleep in order to get in just one more chapter. Coffee and a classic box from Crate Joy. Elastic book mark. Because the paper ones get torn and bent and don’t last very long. This genius book weight. Where has this been all my life? Personal Library Book Embosser. I may or may not have plans to emboss everything. Again – there are several affiliate links in this post. All revenue generated from affiliate sales is used to support A Dose of Healthy Distraction. See my full disclosure policy. Join my email list for your own semi-weekly dose of distraction.